Here is your chance to get this wonderful item Mattel Presents. 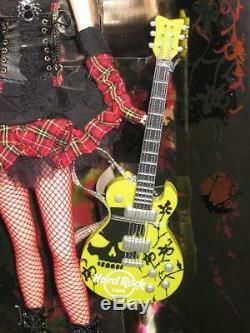 HARD ROCK Cafe Barbie Doll with HRC Collector Pin 2008 Gold Label Model L9663. 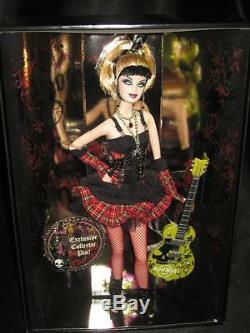 Hard Rock Cafe® Barbie® doll embodies a gothic punk vibe. The doll's black and red goth glam ensemble features a lace up corset top, short flared skirt, vibrant red fishnet stockings, edgy boots, and fingerless gloves. Modeling raw energy and independent spirit, Hard Rock Cafe Barbie doll comes with a jamming HRC "guitar" and collector pin. Doll Mint Condition in box and never been removed from Box Overall Excellent Box with very minor shelf wear Pictures are of the doll you will receive Stored in Smoke Free Home This will make a terrific gift! Or treat yourself to this fine collectible. I appreciate your interest and business. Auctiva Offers Free Image Hosting and Editing. The item "2008 HARD ROCK CAFE Gothic Barbie Doll/HRC Collector Pin Gold Label L9663 NRFB" is in sale since Tuesday, January 22, 2019. This item is in the category "Dolls & Bears\Dolls\Barbie Contemporary (1973-Now)\Barbie Dolls\Pop Culture Barbie\Hard Rock Café". The seller is "jbga1" and is located in Midland, North Carolina. This item can be shipped worldwide.